Keep it connected with the Skagen Connected men's digital watch. Built with a sleek black stainless steel case, a minimalistic black face boldly displays the digital time, alongside your heart-rate, the day and date, the battery level indicator and the Skagen logo, all easily read at just a brief viewing. 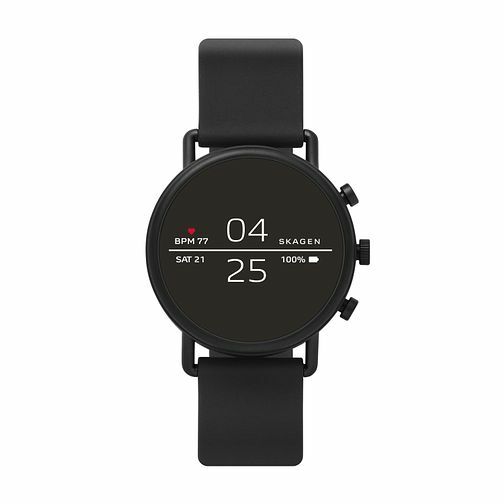 Bridging the gap between fashion and wearable technology, this Skagen Connected smartwatch can connect to your phone via an app, allowing you to receive notifications straight from your phone to your wrist, and embedded LINK technology can take photos or control music for your mobile. Sat on a black silicone strap, this timepiece is perfectly practical for a guy constantly on the go!